Finally we are working on Dupree’s fixed gear bike. The wheels are finished now he started installing the bottom bracket on his matt black Flying Banana frame. The next step was the headset. As his frame is lugged he is installing a Italian threaded headset. This year we are celebrating our 4th annual event series of „Greening the Beige“ GTB10: Plant Your Seed. 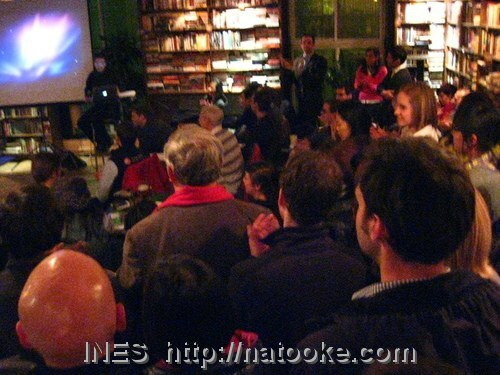 Warming up to the full month of „green“ creative thinking and doing, there was a 1st-event „mini“ Pecha Kucha Night at The Bookworm, hosted by Beijing Green Drinks and Greening the Beige. Shannon spoke about hear an idea for re-inventing Beijing’s roadside bicycle repair stations which was really interesting. 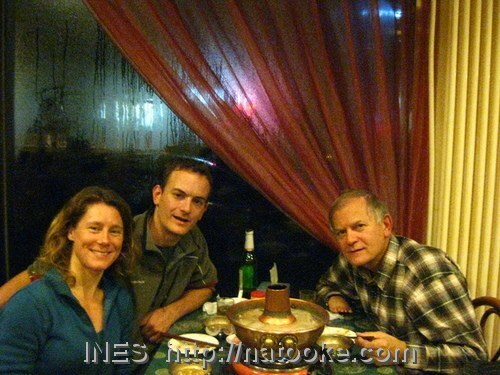 After that Julien and I took his father for a goodbye dinner at a Beijing style hotpot restaurant. This entry was posted on Dienstag, November 9th, 2010 at 23:52 and is filed under Beijing, China, Cycling, Green, Natooke. You can follow any responses to this entry through the RSS 2.0 feed. Both comments and pings are currently closed.